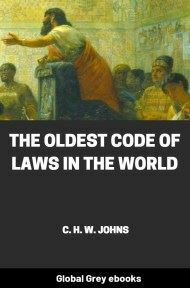 The Oldest Code Of Laws In The World, The Code Of Laws Promulgated By Hammurabi, King Of Babylon, B.C. 2285-2242. The Code of Hammurabi is one of the most important monuments in the history of the human race. Containing as it does the laws which were enacted by a king of Babylonia in the third millennium B.C., whose rule extended over the whole of Mesopotamia from the mouths of the rivers Tigris and Euphrates to the Mediterranean coast.